In the past three years, developments in social networking and internet applications have begun providing internet users with more opportunities for sharing short updates about themselves, their lives, and their whereabouts online. Users may post messages about their status, their moods, their location and other tidbits on social networks and blogging sites, or on applications for sending out short messages to networks of friends like Twitter, Yammer and others. Of the standalone applications that enable short messaging to a network of friends, Twitter is the most well known. First made available to those online in August 2006,2 Twitter allows users to send messages, known as “tweets” from a computer or a mobile device like a mobile phone, Blackberry or iPhone. Users of the service are asked to post messages of no more than 140 characters and those messages are delivered to others who have signed up to receive them such as family, friends or colleagues. Twitter’s open development platform allows outside developers to build add-on applications to expand the service’s functionality. Twitter users can select from a variety of third-party Twitter interfaces, browser plug-ins, photo- and video-sharing applications that enhance mobile and computer-based use of the basic application. Users have themselves expanded the information carried in a twitter message through the development of in-tweet shorthand and symbols3 that allow for the sharing, replicating and searching of tweets. Younger internet users lead the way in using Twitter and similar services. As with many technologies, enthusiastic users have used Twitter for more than just answering the question, “What are you doing?” Twitter has been used to help organize and disseminate information during major events like the 2008 California wildfires, the recent American elections, the Mumbai massacre and even the January 2009 crash of US Airways flight 1549 into the Hudson River. Janis Krum, a passenger on a ferry that rushed to the scene, took a photo of the plane with a cell phone and sent it out via his Twitter feed.8 Twitter and other status updates have also been used for many other purposes including the airing of complaints against companies, sharing ideas, forwarding interesting material, documenting events, conversing and flirting. Twitter and similar services have been most avidly embraced by young adults.9 Nearly one in five (19%) online adults ages 18 to 24 have ever used Twitter and its ilk, as have 20% of online adults 25 to 34. Use of these services drops off steadily after age 35 with 10% of 35 to 44 year olds and 5% of 45 to 54 year olds using Twitter. The decline is even more stark among older internet users; 4% of 55-64 year olds and 2% of those 65 and older use Twitter. Given the youth of most Twitter users, it is not surprising to find that online Americans who live in lower-income households are more likely to use Twitter than more affluent Americans. Some 17% of internet users in households earning less than $30,000 tweet and update their status, compared with 10% of those earning more than $75,000 annually.10 Younger adults generally earn less money than older adults. Wireless internet users are also more likely to be users of Twitter and other status updating services; 14% of users who access the internet wirelessly via a laptop, handheld or cell phone have used a service like Twitter, compared to 6% of users who go online but do not do so wirelessly. The use of Twitter is highly intertwined with the use of other social media; both blogging and social network use increase the likelihood that an individual also uses Twitter. Adults who use online social networks are much more likely to say that they have used Twitter or some other service to update their status and read the status updates of others. Nearly one quarter (23%) of social network users say they have ever Twittered or used a similar service. In comparison, just 4% of those who do not use social networks have ever used Twitter or updated their status online. The correlation between status updates and social network use is less surprising given that many social network sites offer opportunities to post status updates and read the updates of others. Facebook offers a status update feature while other social networks offer taglines and mood updates, often rendered with an adjective and a smiley face indicating the corresponding emotion. Blogging shows a similar pattern; 27% of bloggers Twitter, compared with just 10% of those who do not keep a blog. Overall, 13% of internet users have created a blog. A look at the demographic profile of Twitter users as a whole reveals some additional details about who uses Twitter and how they communicate and consume information. Twitter users are slightly more racially and ethnically diverse than is the full U.S. population, most likely because they are younger – and younger Americans are a more ethnically and racially diverse group than is the full population. Twitter users are also slightly more likely to live in urban areas, with 35% of Twitter users living in urban areas (compared to 29% of all internet users) and just 9% of Twitterers and status updaters living in rural areas, compared to 17% of internet users. Twitter users are more mobile in their communication and consumption of information. Twitter users and status updaters are a mobile bunch; as a group they are much more likely to be using wireless technologies – laptops, handhelds and cell phones — for internet access, or cell phones for text messaging. More than three-quarters (76%) of Twitter users use the internet wirelessly – either on a laptop with a wireless connection, or via PDA, handheld or cell phone. In comparison, 57% of those who go online but do not use Twitter, and 59% of internet users as a whole connect to the internet wirelessly. Overall, cell phone ownership among Twitter users is comparable to the online population as a whole, but Twitter users are more likely to use their cell phone to text and go online. More than four in five (82%) Twitter users have a cell phone and use it to send text messages, while 59% of those who go online but do not use Twitter (and 61% of the internet-using population at large) own a cell phone and use it to send text messages. Along with communicating extensively via untethered mobile devices, Twitter users are more likely to consume news and information on these devices as well.13 For many Twitter users, learning about and sharing relevant and recent nuggets of information is a primary utility of the service. While Twitter users are just as likely as others to consume news on any given day, they are more likely to consume it on mobile devices and less likely to engage with news via more traditional outlets. 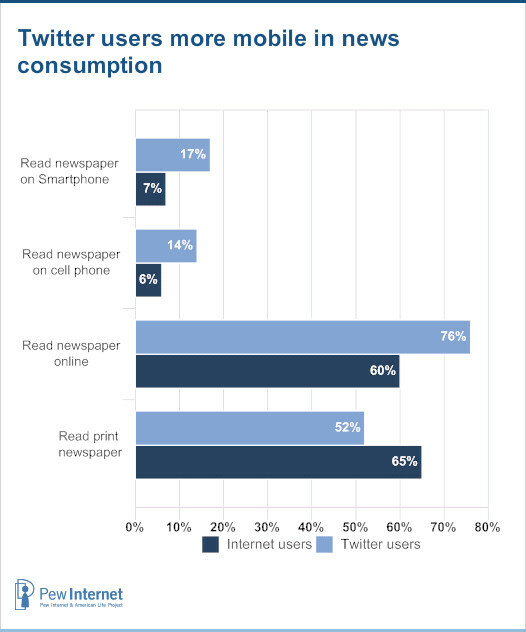 Twitterers are less likely to read a printed copy of a newspaper, but more likely to read a newspaper online (76% vs. 60% of non-Twitter users), and more likely to read a news story on a cell phone (14% vs. 6%) or on a smart phone (17% vs. 7%). A similar pattern holds for video news consumption; on any given day, Twitter users are just as likely as others to watch news on a TV, and just as likely to watch video news on a computer, but more likely to watch a news video on a cell phone (6% vs. 1%) or on a smart phone (8% vs. 1%). Regardless of the platform, Twitter users are also significant consumers of blog content; 21% read someone else’s blog “yesterday” and 57% of Twitterers have ever read a blog. By comparison, 9% of those who go online but do not Twitter read someone else’s blog yesterday, and 29% have ever read a blog. Twitter users also keep blogs at a greater rate than the overall online population; 29% of Twitter users have ever created a blog, and 8% worked on a blog “yesterday.” In contrast, 11% of internet users have created a blog and 3% are working on their blog on any given day. In conclusion, Twitter users engage with news and own technology at the same rates as other internet users, but the ways in which they use the technology – to communicate, gather and share information – reveals their affinity for mobile, untethered and social opportunities for interaction. Moreover, Twitter as an application allows for and enhances these opportunities, so it is not so surprising that users would engage in these kinds of activities and also be drawn to an online application that expands those opportunities.